If you generally struggle with basic web navigation, if you have troubles locating Google search, or if you suffer from a severe FOSS allergy, I encourage you to close this browser tab immediately – this blog is not meant for you. You will gain no other value from it, but mild entertainment at best: please go back to watching cat videos on Youtube – funny cats. OK, I warned you, you didn’t care. I am willing to share a few tips how you can make the new site experience a little bit more bearable. Search by tag (questions and blogs) in the new site. Search by former forum space in the archive. Mystery Meat – view the exact date and time in Coffee Corner. Create a direct link to a specific answer in SAP Answers. Yeah, yeah… I know… we can’t search by tag here, you have to use the Custom Google Search (CGS), it is so much better. With all due respect, I can’t fully agree – it all depends how your mind works, when you search for information. CGS and any other popular search engine work like that: you enter search terms, add a few parameters, press Search and you get a list of results. You get some limited sorting by date and relevance (I agree, Google has way more sophisticated algorithms for that; in general, you get better sorting by relevance), and a few filters by date range, content type and region, but basically you are stuck with your initial result set – if you want something better, you need to change your search criteria and search again. SAP search works in a slightly different way: you enter search terms and get the result list, then you can use the filters on the right (which change items dynamically) to drill-down, until you find what you are looking for. Both options are useful, I have been alternating between these two ever since I registered in SCN. 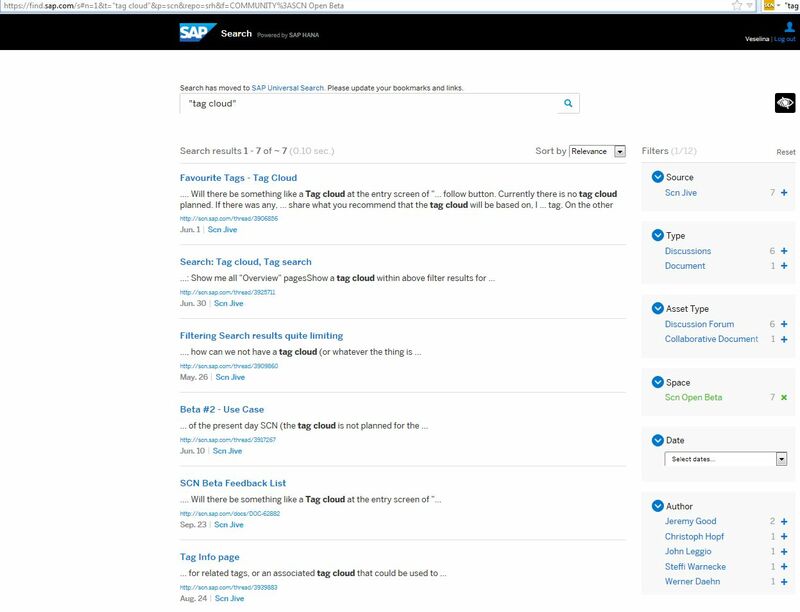 So… How do you search by tag in SAP Search? Open the Excel file – there are a few hidden columns. Un-hide column J (Term ID). This is the technical ID of the tags, which you are already familiar with. We don’t need the click-able links for this exercise. Let’s say, I am searching for taxinn in questions, but I only need the results in SD (Sales and Distribution). Now, how we get only the results with tag SD? The technical ID for this tag is 209057551571413566377230676804921. Yes, you can. Filtering by a single tag or content type is not that useful. The cool part is, that you can use AND in filtering. You apply AND in filters by using ~. 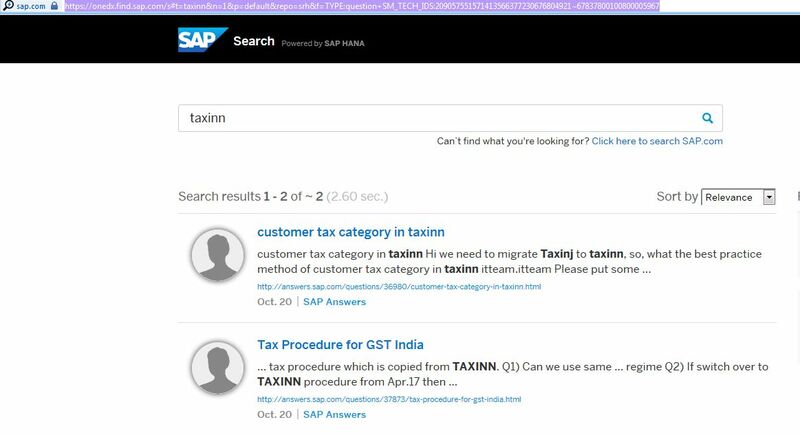 Let’s go back to the previous URL: https://onedx.find.sap.com/s#t=taxinn&n=1&p=default&repo=srh&f=TYPE:question and add one more tag as criteria – SAP Tax Classification and Reporting 67837800100800005967. You need to be careful and select a tag, which is set as Primary and Secondary in the Excel. For example, SAP Tax Classification and Reporting has two tagIDs: 67837800100800005967 (primary and secondary) and 73554900100700001208 (displayed, but not selectable). The second one will not work. You can use a similar approach to select multiple content types, industries or language filters. When you need to search with multiple filters – e.g. content type and tag, you use + between these two to indicate that. When you search with different filter criteria for a certain filter (question and blog), you need to use ~. This is how you search for test. I speak none of these languages, but the results look promising. I might be able to understand content in English and German, but I will leave out Spanish and Portuguese (this could be useful if you look for localization topics). Unfortunately, the language is not always correctly set in the new search – a real shame, I hope SAP will fix that at some point. Until then, I would use filtering by tag, content type and date range by modified (a really nice feature, I wish there were a working option for created on as well). These are not completely reliable either, but nothing really is – in the new site. All good and well, but how do we search in the archive? Update: this trick does not work anymore, because SAP retired https://find.sap.com/ . If anybody knows of a reliable method to search in the archive by former space, please share it in the comments and I will update the blog. Things become more interesting here – I mentioned, that I use custom search engines in my browser. So far, I used one of these – for https://onedx.find.sap.com/ with repository SRH. I have another one, which I created long before the migration – it is for https://find.sap.com/, but has additional filters for forum space. I have absolutely no idea why SAP decided to hide this one and redirect all SCN searches to return results with less options. Anyway, the good news is – it still works! This search is not aware of the new site, so there is no way to get results from questions and use tags. You see the URLs pointing to scn.sap.com, but because redirect is working – you get to the corresponding archived thread. You get also a list of authors – this is how I found Jeremy’s feedback in Open Beta recently. Guess what – we started asking for that in May (thank you, Christoph!). A hint: if you want to get the list of all your discussions in the old SCN (which were migrated, you are probably aware that discussions with no replies were excluded from migration), search with criteria your name, then filter by type Discussion and by Author. The same functionality for applying filters (+, ~) is valid here as well. I cannot guarantee that the functionality will be available in the future – I have no insight of how this project will evolve – the team might decide to switch it off completely or change the functionality behind. SAP search has some nice features and can be really powerful, if indexing is done correctly and if the SAP team decides to invest more time to develop it further (a small change in the design will be more than welcome – there is a limitation on the number of filter items, which you see on the right). This blog became too big now, stay tuned for the next one in the series, which will introduce you to Mystery Meat. for finding the community tags I wrote a little UI5 app that displays all tags and enables searching. Have a look at this blog for more details. Maybe you want to mention it in your blog? Is this the latest app version link? I am making use of tagID values in the excel file, which I did not see in your app. Are you planning a new version, which will show this column? I was thinking to do something similar in Greasemonkey and generate the search URL instead of typing part of it manually, unfortunately this will take me some time – I am still learning how to write good scripts. the links weren’t in the Excel-Sheet I downloaded some days ago. Have to update the app but don’t know when I will find time. If you want to and have time you can fork the project and add the link functionality. Let’s hope that it will gain popularity. Just managed to update the app from my tablet 🙂 . It’s now deployed to HCP, so it has got a new URL. I updated the link to your app and I tried it in Firefox – it looks great! Thank you, Helmut, for helping build a better SAP Community. 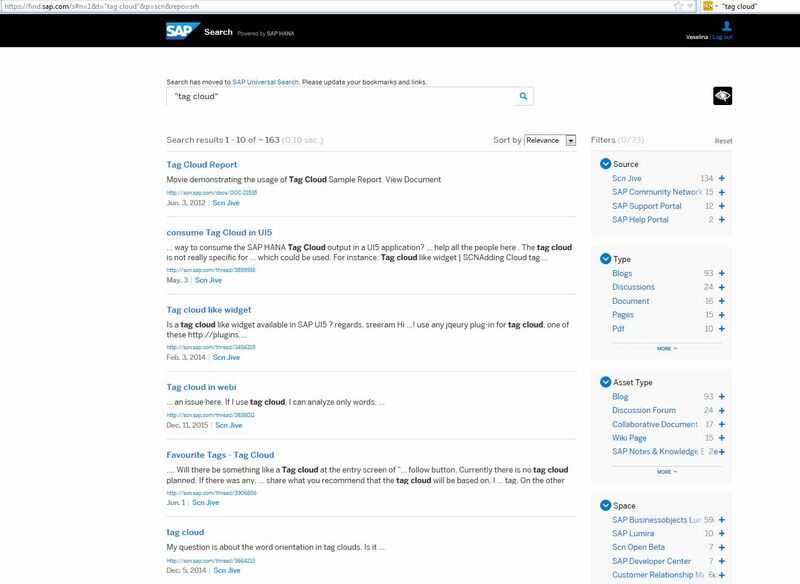 If any member of the SAP team reads this – can we get the app link featured in Getting started (Finding and following tags section), please? Veselina – good to see the level of detail you showcased during the open beta is still as strong as ever. Your customer project specs and as-built documentation must be amazing 🙂 I have been known to hack a URL or two in the past, but am still hopeful that we very soon see the ability to filter and drill down into search results with a tag cloud, checkboxes, and multi-select lists (and as you pointed out, some of this feedback was provided several months ago). Part of the strength of the old SCN was the ability to find and learn about a product or solution, and quite often people used it as a learning vehicle for troubleshooting and discovery, which often meant that the fully prepared search string or terms was not known in advance. Read “Mystery Meat” and “Coffee Corner” and thought this was a blog for me, but when the really interesting stuff was about to start (searches, pff)… cliffhanger! I feel click baited! Going to watch cat videos now. Give me a few more minutes – the Mystery Meat blog is ready, the blog editor is killing me (I think I will need to switch to text view from time to time to complete it) – the default one is definitely not a WYSIWYG. This is definitely what I found, too. WYSINWYG! Amazing thing is that most new blogs are now on how to hack or workaround the new platform…. This is my third blog of yours. Very nice information. I’ll follow your hacks to get around here. I’m going to actively try to get people back onto the SAP site. I’ll be sending them your way. Without these tricks and a custom CSS I am not sure that I would have managed past the go-live. Unfortunately, the archive search trick does not work anymore, because they retired the old search engine. Your post reminded me to update the blog in the unlikely case that someone stumbles upon it (content discovery has not improved significantly since October).